Every hiker understands why they should put a lot of thought into choosing which hiking boots to purchase. You will agree with us that hiking boots are arguably the most important gear in a hiker’s arsenal. Choose the wrong hiking boots, and the hike will be much more difficult than it should be—either due to discomforts, a slippery grip, or sweaty feet caused by low breathability. The best hiking boots for men are those that will push you forward instead of drag you down. Choosing the right hiking boot is crucial to having a great hike. You’ll want your feet to stay comfortable and protected from the rocks and sticks you hike over. You’ll also want your feet to stay dry over the puddles and streams you encounter. The best hiking boots will also make the climb much easier no matter how slippery or muddy the terrain is due to excellent grip and traction. In this article, we’ll talk about what features you’ll want to look for in a hiking shoe or boot and review nine of the best hiking boots for men available. Each of these boots have their own strong and weak points. Some of them are suitable for backpacking during the dry season while others can also handle snowy areas. We will help you choose the boots that suit your needs best. First off, think about what types of hiking you’ll be doing. Light pack or day hiking? Long term backpacking? Dry environments? Wet ones? Now that you’ve got that figured out, we’ll review different fits, styles, and materials you can filter through for your hiking goals. Next we’ll talk about the different parts of the boot that you’ll want to have a working knowledge of to make the best decision for your hiking boot needs. The materials of the uppers impact the boot in a variety of ways. In large part the weight, breathability, durability, and water resistance are all determined by the uppers. There are three types of leather an upper can be made from. Split grain leather “splits away” the inner part of the cowhide, which tends to be rougher, and the smooth exterior. It’s often paired with a combination of nylon or nylon mesh. This is to create a breathability and a lighter weight boot. One of the biggest pros of a split grain leather boot is its lower cost but it is less resistant to water and abrasion. You may want to narrow your search for split grain leather boots that also feature waterproof liners. Nubuck leather resembles suede because it has been buffed. It’s durable, resists water and abrasion, and is fairly flexible. You’ll want to break them in before a long backpacking trip or hike but it won’t need the time full grain leather will. But beware, these boots may show wear sooner because of stitching on the outside of the boot. Full grain leather is used for backpacking boots because it’s so tough. Specifically, it’s abrasion resistant and water resistant. These boots are also much heavier than split grain or Nubuck. They take time to break in and should not be first used on a long backpacking trip, but shorter trips until you are totally comfortable in them. Waterproof membranes are also a great option, albeit not as commonly used. Some examples of waterproof membranes include Gore-Tex and eVent. Uppers are made from these materials so feet stay dry. The biggest negative of waterproof membranes is the reduced breathability which can cause feet to sweat in the summer. A good fit is also very important. Too small and you’ll lose toenails and gain blisters. Too large and your feet will be sliding all over the place, causing more blisters and pain all over your feet. Hiking boots should fit snugly but not be too tight. You’ll want room to wiggle your toes. The space between your longest toe and the end of the insole should be about one thumb’s width. Insoles will change how much room you have in a boot. Take natural swelling into account as well. Try on boots at the end of the day, after your feet have warmed up and swelled. This way you can avoid buying boots that are too small. If you’re able to get to a boot store and see a professional fitter, it’s best to do so. They can measure your foot’s length as well as the width and length of your arch. Being professionally fitted not only offers you the best information about your own feet, but the professionals may also be able to make specific boot recommendations to help you narrow down your options. If you’re buying online, a good rule of thumb is to buy a boot a half size larger than what you wear day to day. Most boot companies keep a consistent foot model, so again if you’re buying online, it’s a safe bet to also buy from a company you’ve worn before. There are several different types of hiking boots—each with their own pros and cons that you should take into consideration. The first one is hiking shoes. Hiking shoes are best for day hiking and light weight hikes. They are low cut with minimal ankle support and feature flexible midsoles. Similar to hiking shoes are trail running shoes. This article doesn’t focus on the best hiking shoes for men, but if you feel that boots are too heavy or clunky, especially if you’re a trail runner, something like this will be more your style. 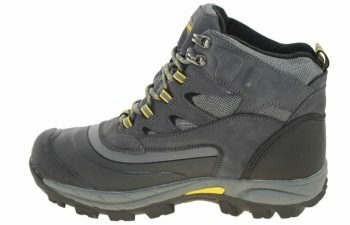 Day hiking boots are boot that have either mid or high cut styles are meant for day hiking or light backpacking trips. They aren’t as durable or supportive as true backpacking boots but they are a step up from hiking shoes in both of those areas. They require a little more breaking in than hiking shoes and are flexible. Backpacking boots are decently heavy, leather, have a high cut style for ankle support, and a stiff midsole. They are designed to help you carry heavy loads for long distances and for multiple different types of terrain and weather. If you’re looking at mountaineering boots, you’ll want to get ones with insulation. This way your feet stay warm in the cold, rugged, conditions you find yourself in. It is usually made from a synthetic material. Usually, all hiking boots with insulation are waterproof because they need to be able to handle moisture if they were to perform nicely in snowy areas. But not all waterproof boots are insulated, so be careful about which boots you choose. The midsole of a hiking boot buffers your feet from shock, cushions them, and is what determines the stiffness of a boot. On uneven, rocky, terrain, the stiffness of the boot can grant your greater stability and comfort as the miles progress. The most common midsole materials are made from EVA or polyurethane. EVA (ethylene vinyl acetate) is used to provide support. It’s similar to the foam Crocs are made of. It’s lighter, cushier, and easy on the wallet. Unfortunately, its life span is related to its density. The less dense the EVA, the faster it will break down. Polyurethane lasts longer than EVA and is firmer. It’s more likely to be found in backpacking and mountaineering boots. There are two internal supports in hiking boots: shanks and plates. Shanks are sandwiched between the midsole and the outsole. They’re between 3-5 mm thick and add load bearing stiffness to the midsole. Their length varies, either covering the entire length or half of the midsole. Plates are found between the midsole and the outside, but below the shank. They are thin, semi-flexible inserts that protect your feet from getting bruised by the terrain. Hiking boot outsoles are all made of rubber. Sometimes you’ll also find things like carbon to add to the hardness of the boot for durability. Something to look out for here though, if the outsoles are too hard than can interfere with grip and feel slippery off the trail. There are two parts to a rubber outsole: Lug Pattern and Heel Brake. Lugs are bumps on the outsole that give traction. Widely space lugs are great for shedding mud and offer good traction. The deeper and thicker the lugs are the more they improve grip on backpacking and mountaineering boots. The heel brake is the part of the boot is designed to prevent you from sliding forward in your boots, especially on steep descents. Now that you’ve got a good idea of what features you should take into consideration when choosing the best hiking boots for you, we’ll move on to the top 9 recommendations. 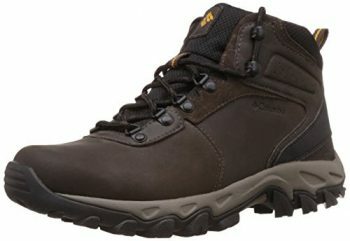 The Columbia Newton Ridge Plus II Hiking Boot is a great boot to get started on day hikes with. It’s lightweight but durable and has a bit of stiffness for added support and durability. Its flexible features allow for a wide range of temperatures and hikes. This boot’s upper is made from a combination of leather, suede, mesh, and metal hardware. The midsole is designed for comfort with high quality cushioning. The outsoles incorporate the ingenious Omni grip® technology that allows the boots to have great grip and traction even in muddy or slippery areas. This boot runs true to size. It’s worth noting that some hikers have had trouble with stitching around the buckle. Columbia also offers this boot in wide sizes. Choose the right size, and you will have a pair of boots that will feel really comfortable and dependable around your feet. But you need to be a bit more careful with these boots when it comes to maintenance because it’s made from leather, and as you know, leather can be easily damaged by improper drying methods. Related: If you don’t know what kind of pants you should pair these shoes with, consider these Columbia Silver Ridge Convertible Pants. Made from the same manufacturer, you can expect the same level of comfort and durability from these pants as you do from the shoes. 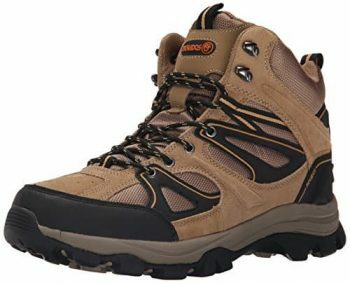 The Nevados Talus Hiking Boot is a great choice for day hiking in dry climates or men who work on their feet as it is not waterproof but it is very lightweight. They stand up to mud well and small puddles but anything more than that will get your feet wet. These boots may not be waterproof, but they make up for it by reinforcing the other properties such as cranking up the level of comfort and durability. Made mostly from canvas, they are comfortable and breathable, making them a great choice for sweat free feet hiking in the summer. They also have an inner lining that keeps your feet from rubbing up against the rough materials of the upper. The upper is durable and the outsole offers great stability. The toe and heel caps are reinforced and the tongue and collar are padded. The traction of these shoes is also exemplary. The outsoles are extraordinarily aggressive, so you would not have any trouble scaling up a particularly slippery hillside or making your way up through smooth rocks. Related: Nevados also offers a waterproof boot called Nevados Spire Hiking Boots. If you’re planning to go somewhere that has a wet climate and you don’t think the Talus is up for the task, you should consider purchasing the Spire instead. The Hi-Tech Bandera Hiking Boot comes with a Dri-Tec membrane and moisture wicking lining to keep you dry in the wettest conditions. Its hardware is rust proof to prevent further water damage. Its upper consists of suede and mesh for a combination of breathability and durability. They are quite comfortable and will keep your feet from being sweaty, but make sure to check the size carefully before you purchase them. If you’re thinking of purchasing online, they run small. They are quite narrow width-wise, too. Therefore, it is recommended that you purchase these boots in a store instead of online lest you end up with a pair of boots that don’t fit comfortably around your feet. These boots are not insulated, so they are not suitable for a trek through snowy areas despite them being waterproof. Some customers have also noted poor quality of the laces. These boots come with a fair share of caveats, but good traction is not one of them. With great albeit a bit thin outsoles, you’ll have no problem challenging slippery areas. Related: Because these boots are not insulated, you’ll need a pair of socks that can keep your feet reasonably warm when the weather gets cold. These SEOULSTORY7 Hiking Crew Socks would do the job nicely. The Timberland White Ledge Boot is full grain leather and seam sealed—all to prevent water from penetrating the boots. They are an amazing pair of boots for all climates and seasons. Waterproof and warm, they can be used to challenge snowy areas. Breathable, they will keep your feet from getting sweaty in the heat of summer. The footbed on this boot is built for breathability. It’s made from dual density, perforated, EVA, which means air circles and wicks away moisture. The padded collar and tongue also work to keep your ankles both comfy and protected as you go about your adventures. The rubber lugs on this boot are designed to be multidirectional, allowing you to brake, accelerate and climb without undue effort or slide. This also makes them great for gripping in the snow or on rocks and gravel. Not much of a break in period is needed with these boots. They run true to size, and the laces stay tight. Related: Since these boots are made from good-quality leather, you should maintain it periodically. A bit of extra care will go for a long way with these boots. Purchase this Fiebing’s Mink Oil Paste and you would be able to easily make your boots shine like new. The KEEN Targhee II Hiking Boot offers great support for unpredictable terrain. The rubber outsole and mid height of the upper offer stability when on the trail. They’ve even offered more protection around the toe to guard against bruising from rocks and roots you will encounter. This boot also features a wider toe box than most. These boots are made to be able to withstand water and snow. With high-quality nubuck leather that keeps moisture out and a hydrophobic mesh lining, you will hardly need to worry about your feet getting wet even if you’re challenging a rainstorm. The mesh lining also makes sure that these boots are breathable, so you won’t have any problem with sweaty feet even in the height of summer. Over the past two years there have been increasing manufacturing complaints, with buyers attributing the changes in quality to Keen outsourcing it’s production overseas. In terms of fit, Keen recommends ordering a half size larger than your typical size as these boots run small. Related: Despite the drop in production quality, these boots are still a worthy purchase. You can counter the minor discomforts by adding this Keen Utility K-20 Cushion Footbed to the bottom of the boots for added cushioning. Salomon Quest 4D 2 GTX Hiking Boot can be summed up in three words: lightweight, protection, and stability. 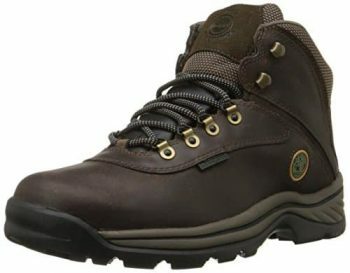 These boots have amazing stability and grip plus an ergonomic tongue for a more comfortable walk in the woods. 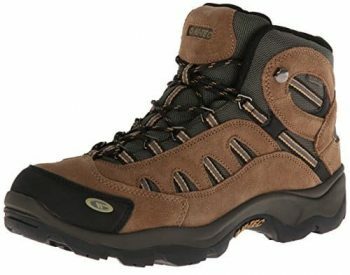 They are also amazingly durable and would be able to withstand a long hike in a challenging trail without much trouble. The combination of protective inner lining and ankle tongue is amazing because they keep your feet comfortable. They also protect you against blisters that often come from excessive contact between skin and the rough upper materials. There is a unique lacing system that allows you to adjust all three levels to your comfort, but be sure to double knot especially if you are challenging a particularly tricky trail because you would not want these boots to slip off. The design details differ from many other boots, making you look as good as you feel. These boots do not have a long break in period and run true to size. Unfortunately, they are not insulated despite being waterproof. Related: If you plan to wear these boots on a backpacking or a long-distance hiking trip, be sure to have an equally dependable backpack with you. This Osprey Atmos 65 AG Backpack is definitely up for the task. The Hi-Tec Altitude IV Hiking Boot is built from a Nubuck leather upper and features a soft padded collar and gusseted leather tongue. The outsole is made up of carbon rubber, allowing for excellent traction. The midsole is made from EVA making it cushiony and lightweight. This combination makes it a great choice for hikers with wide feet and high arches. This boot is fully waterproof so it’s the perfect choice if you plan to challenge the riverside or places with a wet climate. The EVA midsole also keeps these boots breathable, so you won’t have to worry about sweaty feet if you plan to wear these boots to a place with a hotter climate. It has an eye-catching design. Many people even go for it just because they are attracted to that. Due to Hi-Tec moving their production overseas, there has been a sizing discrepancy over the past few years. It’s recommended you buy a half size larger than you would have with this brand in the past. Related: Don’t forget to purchase a high-quality backpack to go with these high-quality hiking boots. TETON Scout 3400 Backpack is one candidate you should take into consideration. It is one of the most popular backpacks available on today’s market. 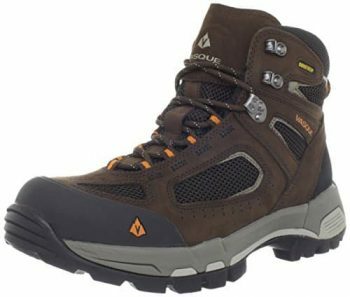 Vasque Breeze 2.0 Hiking Boot was designed to balance waterproof abilities with breathability. The Gore-Tex lining is paired with moisture wicking nylon to keep your feet comfortably dry throughout your hike. This boot’s upper is made from 2mm thick Nubuck leather and nylon mesh panels. It features an EVA footbed and the midsole molds to your foot for support and cushioning. The EVA footbed also offers amazing breathability. Your feet can get hot and sweaty quickly especially if you’re hiking in the summer or in a tropical area, but don’t worry because the EVA footbed has got you covered this time. There is also a thermoplastic urethane plate to help keep your feet supported and stabilized over rough terrain. To keep debris out, the tongue is padded and gusseted. The outsole is Vibram, known for its durable and high quality grip. These boots break in quickly and it’s recommended that you buy them a half size bigger than your normal size. Don’t worry because you can still return them if these boots are still too small even after you’ve gone up by half in boot size. Vasque promises a risk-free purchase. Related: Although these boots have amazing inner lining and won’t give your feet blisters even if you don’t wear socks especially designed for backpacking and hiking, it’s still recommended for you to go for specialized socks such as the MIRMARU Sports Crew Socks. The Khombu Flume 2 Boots are meant to withstand snow and ice conditions. They are fully waterproof and have Thermolite insulation. They are rated to up to -20 °F. These boots feature a sturdy rubber grip, allowing you to hike on with confidence. With such a low price, you might be worried that there’s a catch with these boots. True enough, some customers warn that after 2-3 months these boots leak. However, others have also reported that these boots have been able to last them for 3 years and still counting. Overall, it depends on how you use and care for these boots. They might not be the most durable boots available, but for the price tag and the list of features they offer, they are a good value for money. While the widths of these boots run true to size, the overall boot runs large. For some this can be remedied with an insole or thicker socks but others may need to purchase a half size down from their usual size. Related: Khombu also offers a higher cut cold weather boot, Khombu Fred-K Cold Weather Boot. Although the Flume should be good enough for most areas, if you’re headed somewhere really cold or a trail that’s really challenging, it’s best to pay a bit more for extra safety. After reading through these features and reviews, you’re well equipped to choose your own boots and dazzle the pros with your discerning eye. At the end of the day, what’s most important is to try on boots in as near to trail conditions as possible and to be clear on what you’re using these boots for. You’ll want to recreate the conditions you’ll be wearing these boots in. That doesn’t just mean walking up and down stairs, lapping the store, or finding an incline. It means wearing the socks and insoles you’ll be wearing when hiking. Do not wear slow drying, blister inducing, cotton. Go with a synthetic or merino wool sock. Wool socks plus a liner are thicker than daily use socks. With that in mind, it’s much easier to not get overwhelmed. To keep it simple, the more intense your hiking, the more durable and high cut your boot will need to be to keep you blister free and comfy. For day hiking, you can focus more on flexible materials and a lower cut around the ankles. Boots might be the most important piece a gear you can buy, make sure it’s exactly what’s going to work for you. Now get out on a trail and break ‘em in! 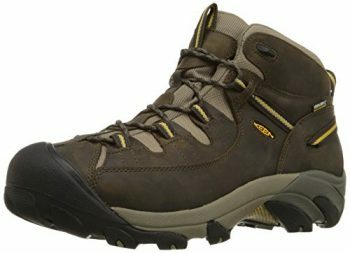 What are your favorite hiking boots? Do you have a certain style or type that you think is best? Did any of the hiking boots for men we’ve mentioned above make the cut? Do you have any other awesome suggestions you’d like to share with your fellow hikers? Let us know about it in the comments section below!